If winter isn't quite over where you live (it's not over here, although it WAS 60 degrees yesterday!) 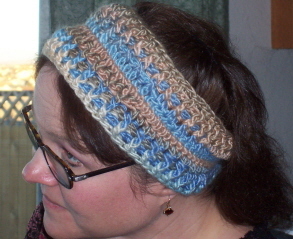 and you've been dying to try a Calorimetry but alas, you don't know how to knit, here's another option for you. Materials: 1 skein Paton’s SWS in color of your choice, size I hook, tapestry needle for weaving in ends, needle & thread for sewing on button, one button approx. 1” diameter. Row 1 - Sc in 2nd ch. from hook and in next 19 chs. Hdc in next 5 chs, dc in next 20 chs, hdc in next 5 chs, sc in next 20 chs. Turn - do not chain one. Row 2 - Sc in 1st 5 sts, hdc in next 10, dc in next 10, fpdc/bpdc over next 20 dc, dc in next 10 sts, hdc in next 10, sc in last 5. Turn - do not chain one. Row 3 - 5 sc, 5 hdc, 5 dc, 40 fpdc/bpdc, 5 dc, 5 hdc, 5sc. Turn - do not chain one. Row 4 - 5 sl st, 5 sc, 50 bpdc/fpdc, 5 sc, 5 sl st. Fasten off. Note: On row 4 you begin the fp/bp crochet with a BACK post, rather than the front post of row 2 & 3. 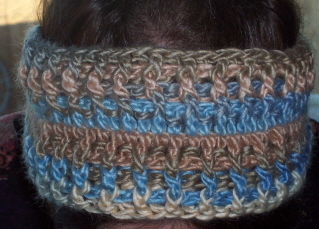 This is so your stitches will line up & keep the ribbing constant. 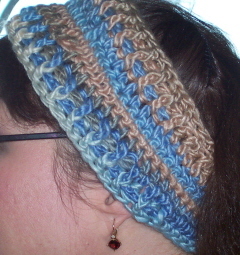 Turn work over and working in the free loops of the foundation chain, attach yarn in 1st loop. This time chain one. Work one sc in joining loop, then one more sc in next loop. Chain 2, skip next 2 loops, sc in next 16 loops. (Buttonhole made.) Continue as for row 1 to end. Row 2: Work as for Row 2 on side one, but work 2 sc in ch 2 space. Sc to end. Rows 3 & 4: Same as side one. Weave in ends. Sew on button. Enjoy! Modifications: This headband is a size large. For a child’s headband I would chain 61. You would then have 5 less single crochets per side on your first row. The second row I would take out 5 of the hdcs, on the third I would delete the 5 double crochets. That would leave 10 less fp/bp double crochets on row 4. Adjusting the size would always be easy - just add or subtract in even groups. 3 on each side, 5 on each side, 7 on each side, etc., adjusting how many scs & hdcs you would add or subtract on subsequent rows. If you want to add a 5th row to the band, sl st over the first 10 sts, fpdc/bpdc over next 50, then slip st in final 10 sts. I'm off to teach 6th grade English - have a good one everyone!